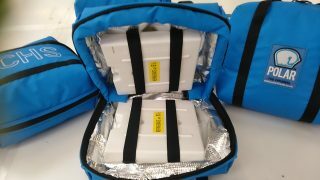 Thermal bag suitable for the transport of vaccines & medicals. Ideal for use by nurses and travelling medical staff. Used with gel packs to extend thermal performance when being opened and closed regularly. Will maintain a product temperature between 2°C and 8°C for up to a maximum for 4 hours when in use. All materials are waterproof, have rot proof stitching, are antifungal and come with a two year guarantee, subject to normal wear and tear.